I'm originally from the D.C. suburbs, and it's where my dad still lives, which not only makes it an easy weekend getaway for our family (it's only 4-5 hours down I-95), but also a cheap one! We head down to my dad's house several times a year, but the summer is by far my favorite time to visit to take advantage of my dad's pool and his Segways! That's right, I said, Segways (plural). No, he doesn't have a tour company that takes you around the D.C. Mall. Years back, my dad bought a few all-terrain Segways for his backyard. See, he lives in Rockville, MD and his house butts up against Rock Creek Park. It's a huge park in Maryland that goes all the way to D.C. with all sorts of things to do. So, one of our family's favorite pastimes is to hop on the Segways and go on a "hike" around the park. Segways are amazing for off-roading in parks because they're both incredibly fun (if you've never been on a Segway, I highly recommend it!) but, unlike an ATV, they're also almost totally silent. But that doesn't keep me from being a little embarassed passing by actual hikers on the nature trails. Segways aren't for toddlers, but once Sally's a little bit older, we can't wait to take her along. Another pastime I like to do now and again when we visit the D.C. area is ride horses. I grew up riding horses competitively, so it was a big deal for me to take Sally down to Hillcrest Farm (the farm in Virginia where I grew up riding), meet my trainer, and meet a few horses! Horses were my best friends growing up, and I want Sally to love them too! Just not too much that she wants to ride them competitively though, because these days, owning a horse ain't cheap! Since this is a travel blog, odds are you aren't going to be visiting my dad's house (although if you really wanted to, he'd be the first to invite you for the weekend), but Washington D.C. is also a great city for tourists! The Metro system is clean and some of the stations look straight out of Star Wars. It goes without saying that there are excellent museums and monuments, but what not everyone knows is that most of them are FREE which makes them great for toddler tourists since you can easily pop in and out. This is especially convenient in the summer months when you really need to get out of the heat and into the air conditioning. Given that The Harrises are into space, the National Air & Space Museum is one of our favorites! The main museum is right on the Mall in DC and is part of the Smithsonian. I recently saw a stat that this is one of the most visited museums in the world. It has such heavy hitters as the Wright Brothers' plane, the Apollo 11 Command Module, and Charles Lindbergh's Spirit of St. Louis. 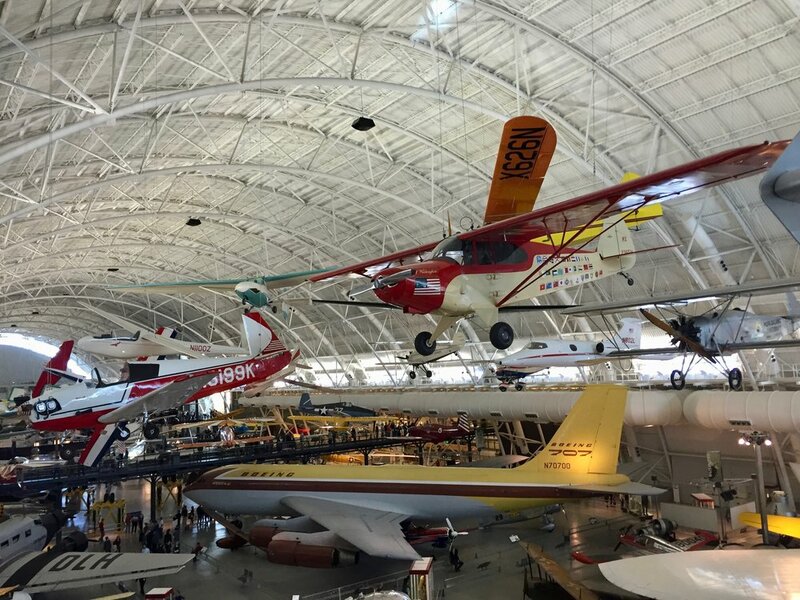 What most people don't know and what we recently discovered is that the museum has a second location, Udvar-Hazy Center, near Dulles Airport that houses larger planes, satellites, and most impressively, the Space Shuttle Discovery. We've been a few times since Sally was born and she loves it! Seeing the planes and spacecraft up close and thinking about their journeys is truly humbling and amazing for adults and kids alike. And of course, there's a solid gift shop as well that has everything from kid's space suits (Sally's first halloween costume was Sally Ride) to legos to Star Trek memorabilia to NASA oven mitts (a must have for any space-themed kitchen... uh, ours). This particular trip was a quick one, but there are many other world-class museums and monuments all in the same area, right around the National Mall – the National Gallery of Art, National Museum of Natural History, Holocaust Museum, Hirshshorn Museum, National Museum of American History, National Museum of the American Indian, Washington Monument, Lincoln Memorial, Jefferson Memorial, MLK Memorial, FDR Memorial, Vietnam Veteran Memorial – the list goes on and on!